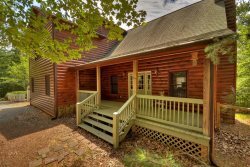 Roaring River Retreat is located in Ellijay, Georgia in the Coosawattee River Resort, just 10 minutes from town and it's right on the river. This spacious home provides a great place to entertain family and/or friends or just relax with that someone special. Grab a good book or your favorite beverage and rock a while on the deck, listening to the music of the Coosawattee. The well equipped kitchen is open to the great room where a lovely rock gas log fireplace will surely warm you up on a cool North Georgia night. The impressive King Master loft upstairs, is as comfortable as it is beautiful and comes complete with a 32" flat screen TV and a stylish private bath with it`s own jetted tub. (Please note, the master bedroom is a loft (i.e. no fourth wall). This design enhances the “cabin feel," but does come with a slight decrease in privacy.) The Main floor bedroom offers a full and twin bunk and looks out over the River. The full bath on this level offers a walk-in shower. The terrace level provides another entertaining hot spot with a pool table, a 47" flat screen TV with seating and another King bedroom and a full bath with walk-in shower. The space is perfect for a quiet, relaxing get-away.